I don’t know what’s brought it about, but lately I have been really excited about all things TexMex, even though I’m still not entirely sure what that means. And casseroles. We’ve had rain for days here, and the only thing I really want to eat is bowls of brown sugary oatmeal for breakfast and pans of melted cheese for dinner. I am so grateful for leggings and loose tops right now, and hope that stretch denim never goes away. 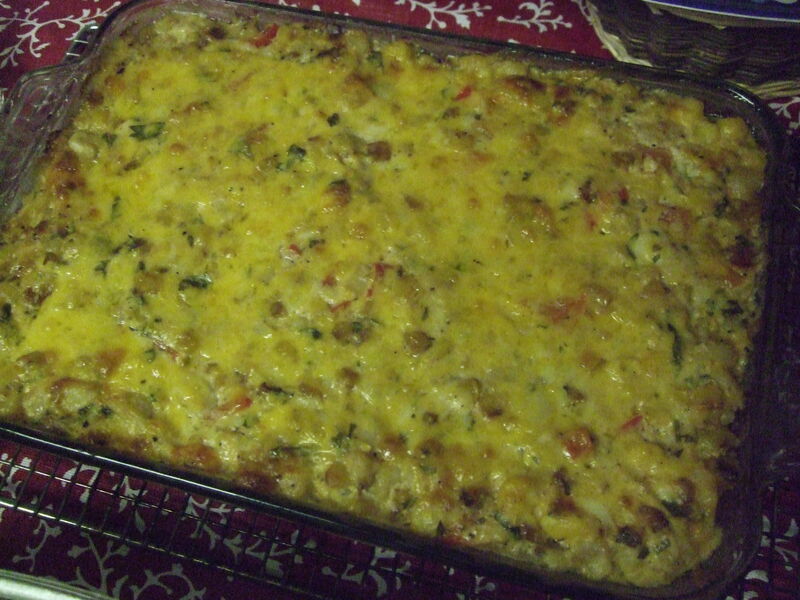 My understanding of hominy casserole is that it’s a debaucherous combination of corn, cheese, and bacon, and I’ll certainly be making that to go with roast chicken very, very soon. But it’s Meatless Monday, which always feels like an opportunity to get creative. I find that not using bacon as my go-to herb means finding sumptuousness in other ingredients, and in this case, the result is a dish that tastes a bit like nachos: a very good thing. 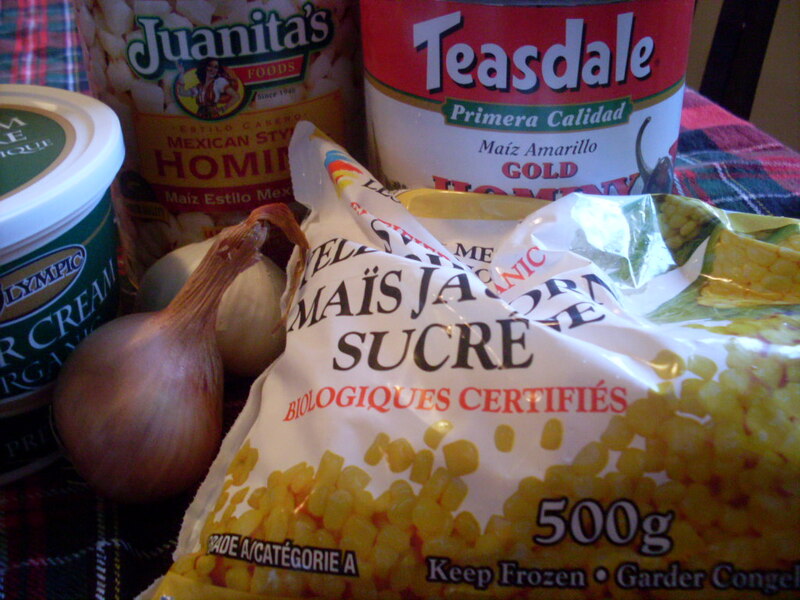 Hominy is a type of corn, and it reminds me of a cross between potatoes and tortilla chips. If you’re in Vancouver, you can buy cans of hominy (white and yellow) at Killarney Market at 49th Avenue and Elliot Street. Everywhere else, check the Latin section of your local market. Unfortunately, I didn’t have my camera when this was plated. 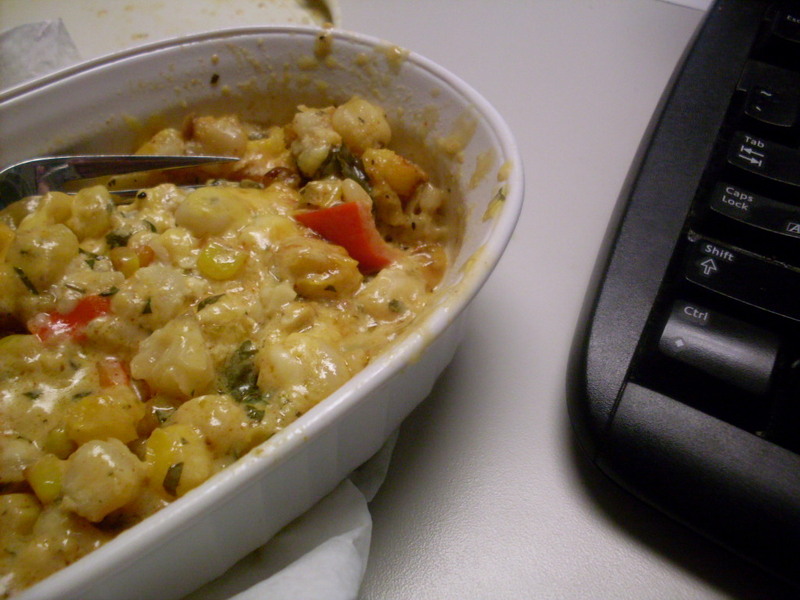 I actually took a photo of the reheated casserole on my desk at work at lunch today, where the microwave melted everything into a gooey puddle of cheese corn. Excellent tasting, but not beautiful. Preheat your oven to 400°F. Lightly butter a 9″x13″ baking dish. In a heavy-bottomed pan over medium-high heat, melt butter. 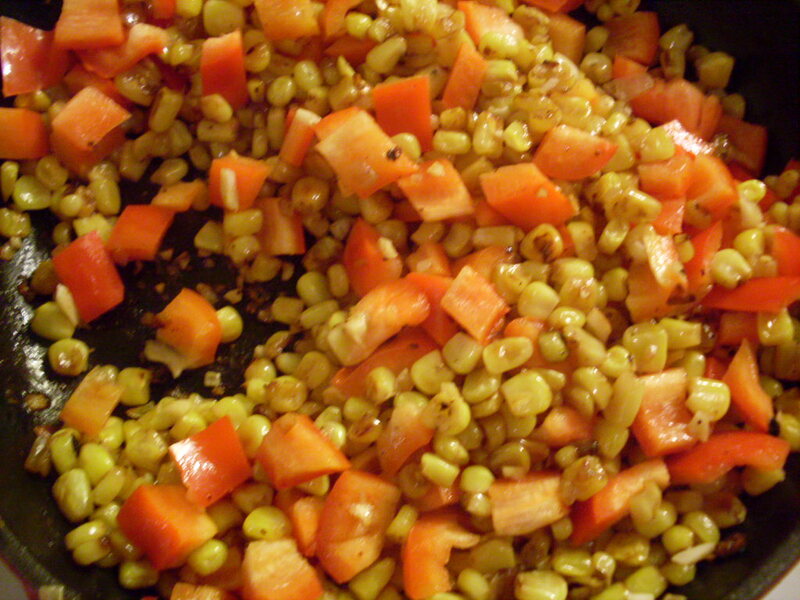 Add shallot and corn, and caramelize until golden brown, stirring regularly for about ten minutes. Deglaze the pan with about 1/4 cup of water, scraping the browned bits off the bottom. Add bell pepper, garlic, salt, chili powder, cumin, pepper, and cayenne, and sauté for an additional two minutes. Meanwhile, drain and rinse hominy. Combine hominy in a large bowl with sour cream, lime zest and juice, parsley or cilantro (or a combination), and both kinds of cheese. Pour pan contents into the bowl, and stir to combine. Taste, adjust seasonings as needed, and pour into your prepared dish. 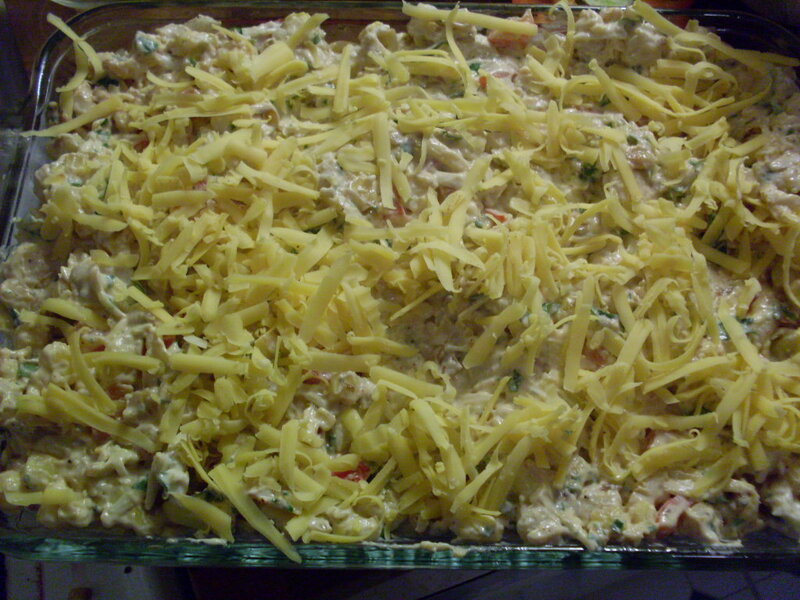 Sprinkle remaining cheese over top, and bake until bubbly and golden, about 20 minutes. Serve with salsa and salad. Oh, and because it’s Meatless Monday all over the Internets, visit the Midnight Maniac blog carnival for all sorts of other fabulous vegetarian recipes! Next > Grandpa’s Radio Pudding. Thanks, Tes – it really is comforting! I served it at a large gathering and everyone seemed to really like it. Highly recommended! Yum…you had me at the caramelized corn. 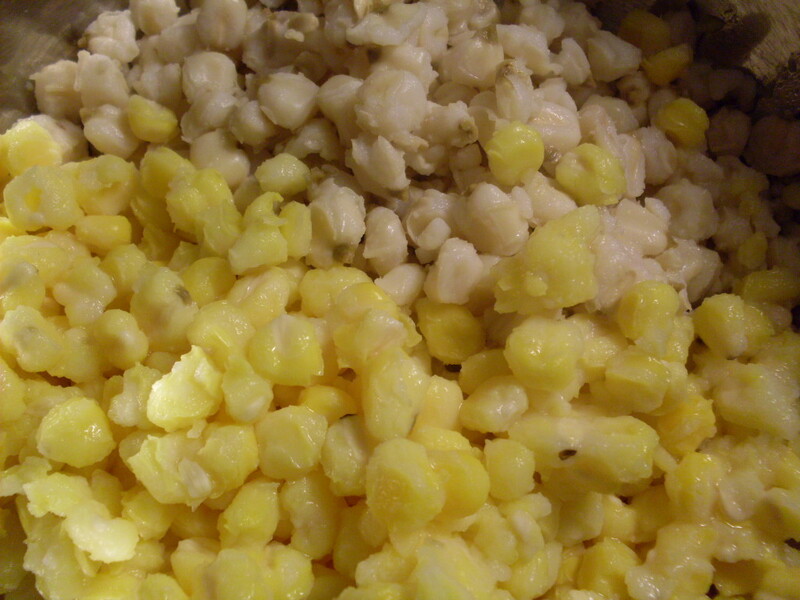 Hominy is corn that has been soaked in lye then washed. The lye breaks the outer coating and causes the guts to swell up kind of puffy. I don’t know who was the first person to do this or why they thought it was a good idea, but your casserole (and I LOVE hominy) looks delicious. 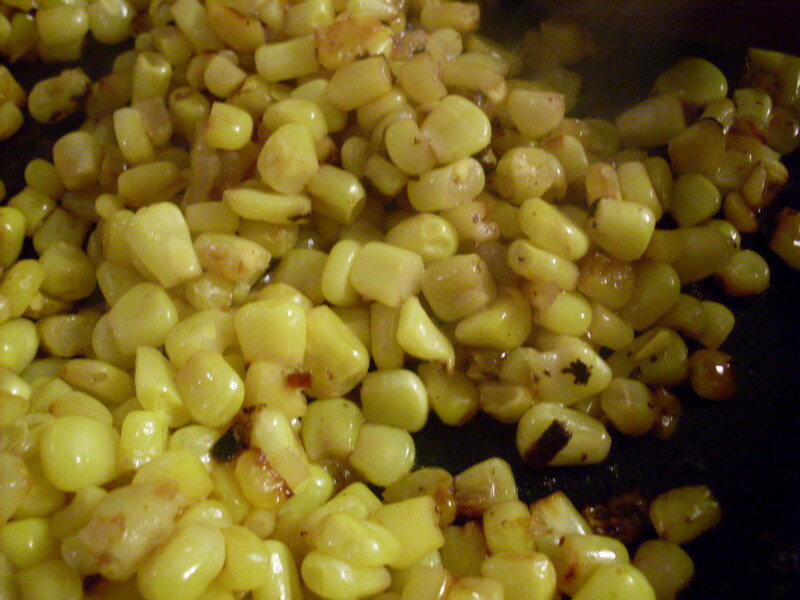 I’ve taken to skillet roasting corn for just about anything that calls for corn-soups or whatever.